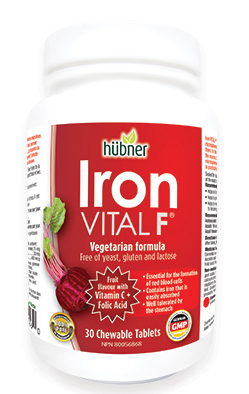 Iron VITAL® F contains a new generation of iron. The microfine Iron F microspheres are coated with special protective layer, which allows them, for the most part, to pass into the stomach without irritating the mucosa. The majority of Iron is not released until the Iron F microspheres reach the upper intestine. This way, stomach irritation is practically ruled out. This formula has a fruit flavour with Vitamin C + Folic Acid. Vegetarian Formula, free of yeast, gluten and lactose. Directions: Take with food. Take a few hours before or after taking other medications. 1 bottle last 1-2 weeks depending on dosage. Non-medicinal ingredients: Isomalt, d-mannitol, cellulose,gum Arabic, beet juice concentrate, maltodextrin, lecithin, starch, calcium stearate, silicon diozide, citric acid, malic acid, natural raspberry flavor, natural blackcurrant flavor, stevia rebaudiana leaf. Contains no added gluten, nuts, eggs, animal products, dairy products, fish or shellfish, wheat or yeast.